Okay, hear us out before you say no. We know that when we say Amsterdam, you immediately think of bachelor parties, student trips, and the city’s penchant for a certain substance that might not be legal where you are, but we promise that the capital city of the Netherlands has so much more to offer. There is certainly an unavoidable tourist vibe, but it is only so apparent due to the relatively small size of the city – you will find the same amount of tourism materials in Madrid or Paris, they are just not so keenly noticed. And either way, the tourists barely detract from the incredible experience that you could have in this beautiful Dutch city! Full of history, culture and the ideal little corners for romantic moments and Instagram-able photo opportunities, discover now why Amsterdam is the perfect place for your honeymoon in Europe! 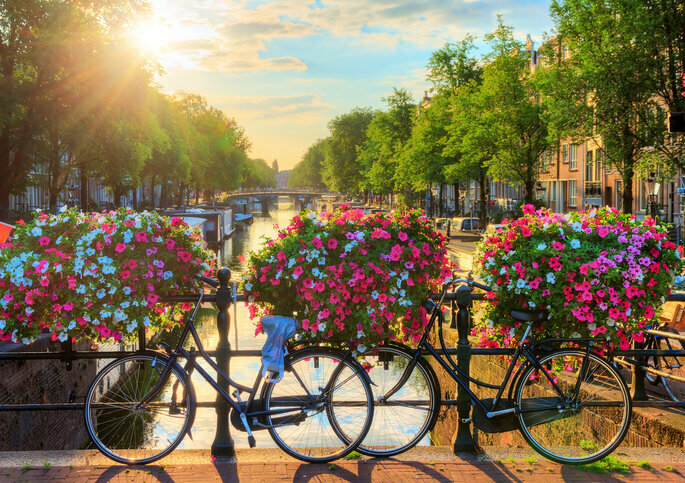 Amsterdam is the capital city of the Netherlands (also known as Holland), and is located in the north of Europe meaning that as long as you’re honeymooning between May and September, then you’re guaranteed to have some sunshine! Dutch is the official language – and it’s tricky, so unless you’re really dedicated, we wouldn’t waste time trying to learn it before going; nearly everyone in the Netherlands speaks English fluently, and even moreso in the capital, so you’ll be fine! As for currency, the Netherlands still favors the Euro, so this is the ideal place to stop off for a few days if you’re doing a cross-continent tour, and an even better one to settle in for the week! Holland is famous across Europe and the world for its incredibly forward-thinking and progressive society. LGBT and womens’ rights are championed here, and Amsterdam itself is a hub for all people of the world, with an incredible diversity of cultures and traditions. And whilst the people are very modern, you can also experience true history and culture everywhere you look in this city. The architecture has barely changed in centuries, and Dutch people remain proud of their heritage. There is a litany of places worth visiting in this historic capital – although be warned: if you don’t have a map, you’re going to have a hard time finding any of them. Whilst we would normally recommend going for a stroll and seeing what you find, Amsterdam is a real-life labyrinth of narrow streets and districts you don’t want to stumble into on your honeymoon, so invest in a guidebook and follow it! Also, keep an eye out for the bicycles – a Dutch person on a bike is ruthless, so whatever you do, don’t walk out in front of them! 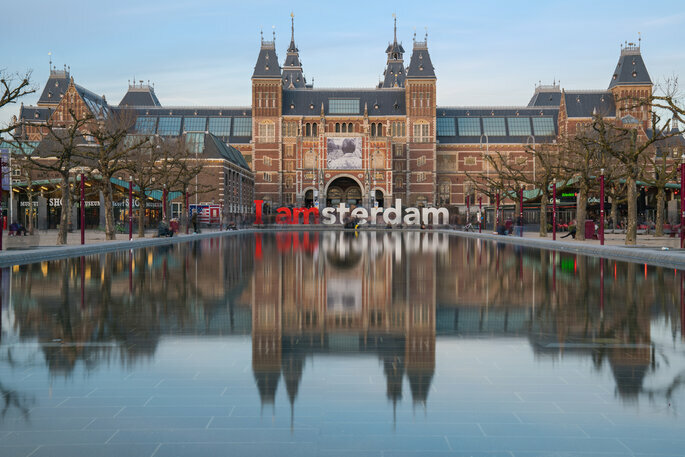 One of the best areas in the city is the museum quarter, where you will find the world-renowned Rijksmuseum and the Van Gogh Museum. A Dutch native, Holland is proud of Van Gogh in the same way that Austria is of Gustav Klimt, and so if you like his work, you’re in luck. 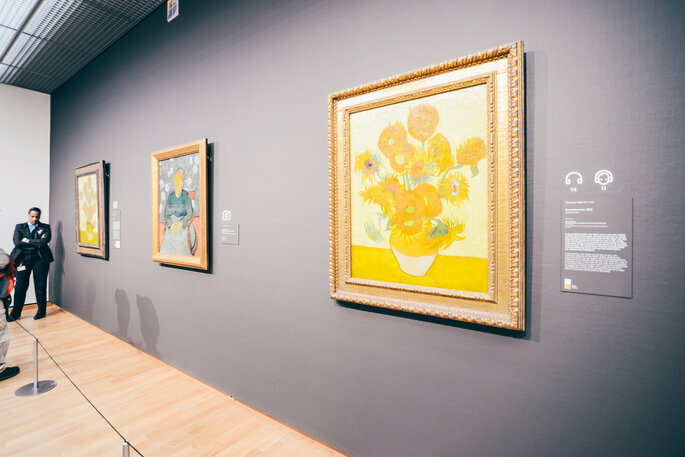 The Van Gogh is a state of the art building housing some of his finest works – including Sunflowers, perhaps the piece he is most well known for. Other famous museums include the Anne Frank Museum (which is a very powerful place, but perhaps not on your honeymoon), but if you don’t want to stay inside all day, there are plenty of options. Holland is the flower capital of the world, and in Amsterdam you will find the incredible flower market. Though photos are not permitted, this is a beautiful place to discover, particularly during the summer months when the vendors take to the water with their colorful products. 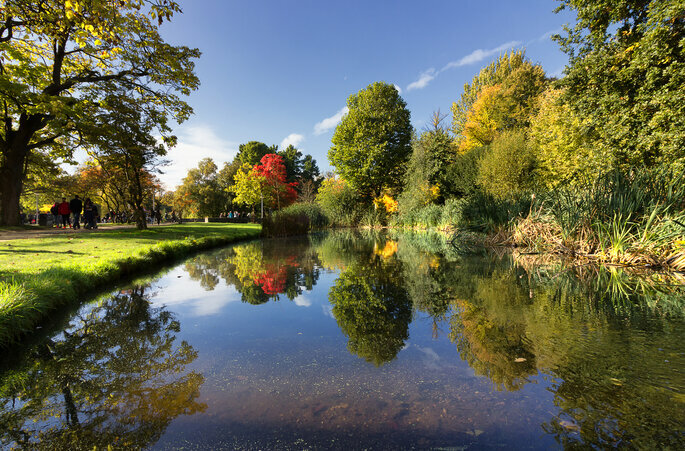 And there are many outdoor spaces to enjoy a romantic picnic – the Voldenpark and Rembrandt parks respectively are lovely. If you’re not sticking to a timetable, then enjoy a stroll down the backstreets and experience the true heart of the city. Cobbled pavements and steampunk lamps will guide your way. And of course, an unmissable activity in the Venice of the North is taking a boat trip! Discover the beauty of Amsterdam on a couples’ cruise around the incredible Dutch canals, and discover a little more about its history too. Taking you from the very south of the city, to open waters at its port, Amsterdam is brimming with canal boats for you to take advantage of. These are usually very cheap, and some of the fancier ones even provide you with food – so enjoy lunch on the water! Other places to visit include: the Dutch National Opera & Ballet, Dam Square, the Royal Palace of Amsterdam and, of course, the Heineken Experience! 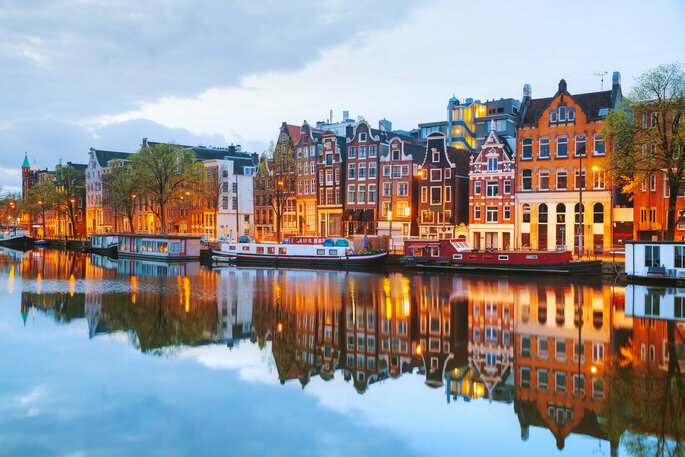 Amsterdam is incredibly well-connected, and due to the relatively small size of the Netherlands, you can explore the entire country with ease. 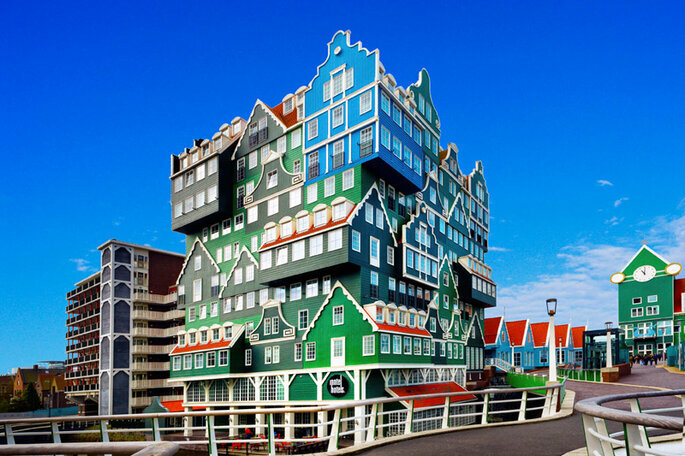 Nearby towns such as Zaandam have a lot to offer in terms of original architecture (as you can see below!) and culinary experiences, and are often replete with wide open spaces to take romantic walks in the evenings. Whilst the perfect place for an intimate trip away, Amsterdam can feel a little cramped after a week, and so for a breath of fresh air, hop on the train in either direction and within 5 minutes you’ll be in the countryside! Holland’s other capital, Rotterdam, is a 90 minute trip on the train and comes highly recommended by Zankyou. 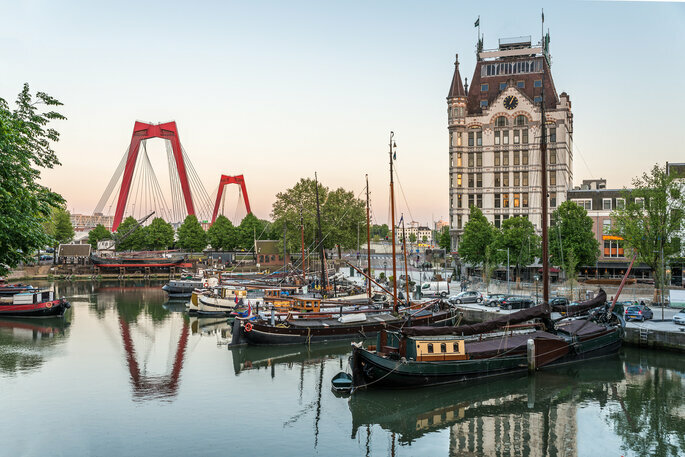 If Amsterdam is historic, then Rotterdam is completely new, with the majority of the city having been rebuilt following intense bombing in the Second World War. Here you will find another whole host of museums, including some modern art exhibitions that are always worth a look! However, the true gem of Rotterdam is its port; one of the busiest in Europe, and stretching on for several kilometres, you can enjoy a long stroll along the waterfront with your new husband or wife. 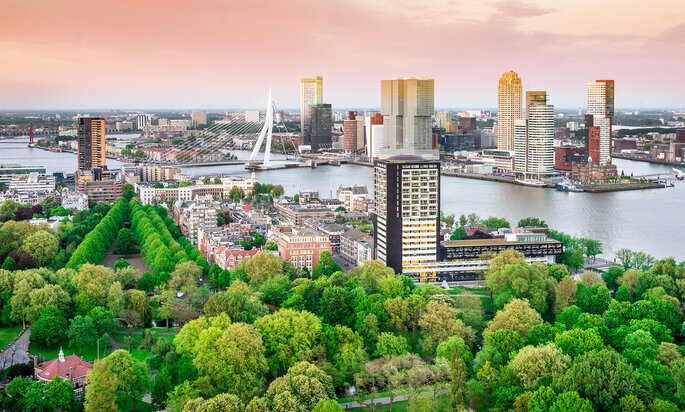 Reminiscent of Central Park, the Rotterdam waterfront is a strange diversion from the sleek modernity of the rest of the city – here you will be ensconced in greenery. You can do the highlights of Rotterdam within a day, and this is the ideal place to go shopping (sorry to all the men out there whose spouses are reading this!) instead of in Amsterdam. However, the jewel of the city is the Euromast. No longer the tallest building in the city, but the best place to get a decent view, feel the wind through your hair at the top of this impressive feature. You’ll not only have a beautiful look over this pretty city, but you can also enjoy a top dining experience in the restaurant on the top floor. Aside from the main cities, much of the Netherlands is countryside. Beautiful yes, but unless you’re looking for total seclusion and relaxation, we would recommend to stick to Amsterdam or Rotterdam! If any one of you is a politics buff, the Hague is also worth a quick trip! The Netherlands is a real winner when it comes to desserts, and nowhere can you get a better taste of this expertise than in Amsterdam. 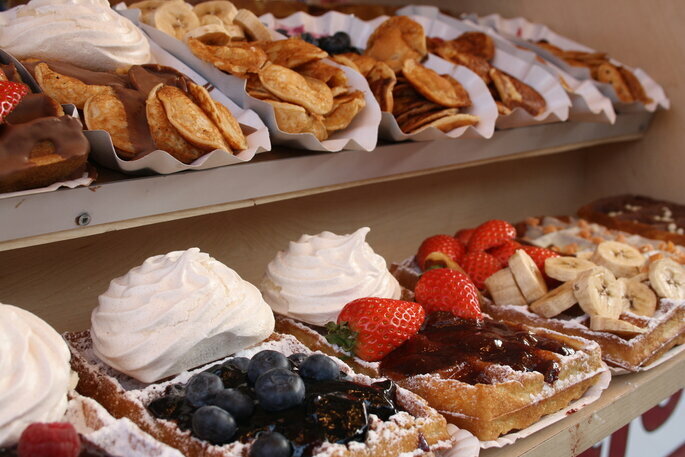 The first thing you must try are the waffles: either stroopwaffles (the biscuit variation), or hot waffles that come with every type of topping you can imagine. You will be able to pick these up at practically every café in the city, on every street corner, so make sure you don’t miss out on this sweet treat! Appeltaart (no points for guessing what this one is) is also very popular, and normally comes with a dollop of whipped cream too. Other sweets you should try include: roze koeken, bitterballen, tompouce and bitterkoekjes. And if your sweet tooth is crying out for a break, then never fear because Amsterdam has you covered. If you’re looking for food on the go, then patat speciaal is a good choice (think chips with sweet mayonnaise and fried onion); traditional Dutch restaurant dishes include stamppot boerenkool (a vegetable dish), stamppot zuurkool, and haring (a type of fish that you eat whole!). However, if the culinary traditions of Holland don’t appeal to you then you’re in luck – as one of the most multicultural cities in the world, you’ll be able to find whatever dish you’re craving. One thing to be careful of when booking accommodation in Amsterdam is that you don’t accidentally book a hostel. If it looks to be good to be true, then it definitely is! There are plenty of lower budget options, but if you’re looking to splash a little cash for your honeymoon, then do we have the hotel for you! 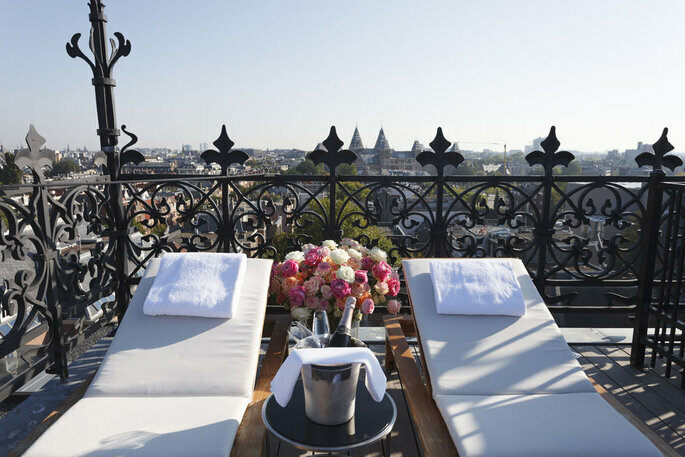 The Conservatorium Hotel Amsterdam is a luxury establishment located in the heart of the aforementioned museum quarter, with easy bus and tram links to the rest of the city. With a swimming pool and wellness spa, enjoy some true relaxation and maybe even some couples’ treatments to wash away the wedding stress! Amsterdam is the perfect place if you want to go somewhere completely different from the States, but don’t want to go too far out into the middle of the jungle! There is plenty to do, and plenty of ways to keep active (bike tours are always a fun way of exploring! ), and for newlyweds, character and intimacy exudes from the narrow streets, cobbled streets and romantic architecture. Easy to get to from the states via plane, with a short-ish flight time of about 9 hours, and with the entire country available from Amsterdam Train Station, then this is the ideal place for your first trip as a married couple!